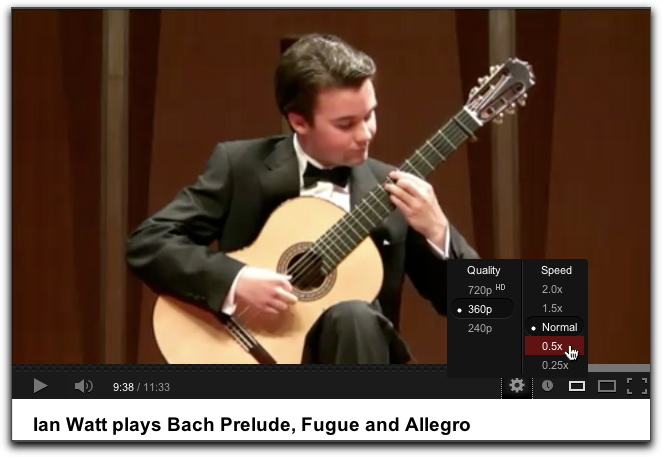 youTube — Variable-speed video playback — Now available! 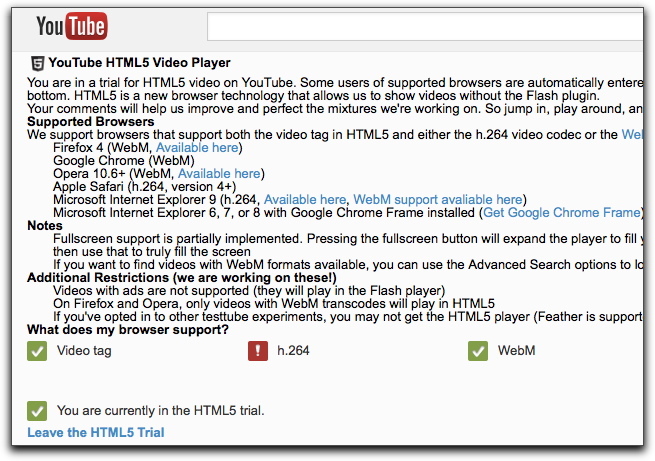 youTube is adopting HTML5. While that might not mean anything tangible to you, the transition already affords some new possibilities, including the benefit of variable-speed video playback. Unfortunately, besides normal speed, presently we have only four speed choices. Slowed playback is available in just two flavors: half speed and quarter speed. Indeed many people will want to slow music for practice, but half speed—while useful, and fairly clear—is pretty darn slow. Quarter speed is nearly useless. Better choices would have been 80% and 60%. Ideally the designers would have provided an input field or slider that lets us pick bascilly any speed. (I've peeked under the hood and can see that "any" speed is possible. We just need the slider! So I imagine that's coming soon. ) Nevertheless, what we have is good stuff. Works on a browser near you? There's an image of the sign-up page directly below. This is what youTube's sign up page looks like. Once you joined the lower link is named "Leave the HTML5 Trial. Clicking that link toggles the trial on and off. After joining the beta program you can control the playback speed of any video. To do so click the Settings "gear" as shown at the bottom of the image below. The image below shows the Setting menu opened. In the left side of the menu you can choose video quality. If you have slow Internet you may want to choose a normal setting like 360p. The Speed portion of the menu appears only if you're in the HTML5 beta trial. Ian Watt plays all three movements of the Bach Lute Suite in his video on youTube. This is a superb performance. Rarely do we hear such warmth and expression along with Watt's level of technical mastery. A truly remarkable performance! Each of the links below contains a "start time" parameter, which takes you directly to the start of one of three movements in this video. NOTE 2013-03-20: Uh oh. Maybe some browsers don't support this wonderful feature. Works in Safari and Chrome browsers, but not it Firefox. I'm pretty sure it worked in Firefox in February 2013, but it certainly no working as reliably as it used to; however sometimes it kicks in when I refresh the page. I was using normal URLs with #t= parameter; I've switched to youtube short URLs and use the ?t= parameter. That works, at least for now! The short URLs above contain a ?t= parameter, which specifies the starting time of playback. For instance, ?t=1m20s means that playback with begin at 1 minute and 20 seconds. There are other ways of setting the start time for youTube videos, but they haven't proved as reliable. There is a parameter for setting the choice of video quality, for instance &hd=1. But the numeric codes have changed recently, so I won't venture which number represents which high definition setting. I don't know if there is a parameter for setting playback speed. You'll encounter a couple of problems if you attempt to play along to Ian Watt's video. He has a capo on the first fret. The BWV 998 Lute Suite is in the key of D, so a capo at fret one would pitch the piece a half step higher, to the key to Eb. This would occur if the guitar was tuned at standard pitch. But actually, the pitch is somewhere between the keys of D and Eb. Perhaps Watt was out of tune at the performance, or perhaps the half-speed feature on youTube affects the pitch slightly.